The following is the first part of Gilad Atzmon’s Expert Witness Testimony at Arthur Topham’s criminal trial. This part contains a brief summary of Atzmon’s perception of the Jews and their politics. In the next part Atzmon will explain how these ideas serve to vindicate all forms of criticism of Jewish politics, ideology, symbols, rituals and so on. Attorney Barclay Johnson: Mr Atzmon, can you please elaborate on the notion of Jewish Identity Politics. In order to grasp these notions we must elaborate first on the meaning of Jewish Identity Politics. Instead of asking what or who are the Jews, we will simplify the question. We will ask what those who identify themselves as Jews mean by that. Years of studying of Jewish identity politics led me to the conclusion that we are dealing with three non-exclusive categories. A: The Religion – people who identify as Jews because they believe and follow the Torah/Talmud. Ladies and gentlemen-this category is innocent. The history of hundreds of years of rabbinical Judaism proves that orthodox Jews have never been involved in a genocidal act against another people. B: Ethnicity – people who identify as Jews due to ancestry and family lineage. Ladies and gentlemen, this category is also innocent. Having a Jewish mother doesn’t make one into a war criminal! C: Politics – those who identify politically as Jews. Ladies and gentlemen, unfortunately, this category is far from innocent. Zionism-the promise to bring about a Jewish homeland in Palestine was executed at the expense of another people: namely the Palestinians. But Zionism is not alone. In fact all forms of Jewish politics are racially exclusive. Ask yourself, can Mr. Topham or any other ‘Goy’ (gentile, non-Jew) in this room join the group ‘Jews for Peace’ or ‘Jews for Human Rights’? The answer is NO. And why? Because the Goyim in the room are not racially qualified. The conclusion is inevitable. The 3rd category is racially oriented and to a certain extent, racist to the bone. ‘Jews for peace’ is in practice as racist and exclusive as “Aryans for Palestine” or “Whites for free love.” And yet, most of us would react angrily to White only clubs but we are somehow forgiving when it comes to Jews only associations. Attorney Barclay Johnson: Mr Atzmon, please make sure that we understand you correctly. Are Jews a race? Expert Witness Gilad Atzmon: Not at all. Jews are neither a race nor they are a biological entity, but Jewish politics is always racist or at least driven by racial orientation! Attorney Barclay Johnson: How does the model you sketched above help to understand Israeli politics, Jewish Identity or progress in this court case? Expert Witness Gilad Atzmon: In practice, every Jew who identifies as a Jew subscribes to one, two or three of the categories above. Let’s examine the case of an American Jewish settler living in occupied West Bank. Yes he follows the Torah (1st category), yes he is Jew by ancestry (2nd category) and certainly, he identifies politically as a Jew (3rd category). But what about the Jewish Marxists who went as far as Spain to fight Franco in the name of the revolution? These revolutionary Jews didn’t follow the Jewish religion, they were not the 1st category. They only subscribed to the 2nd and the 3rd categories. What about Noam Chomsky? He is not a religious Jew. Again, he only subscribes to the 2nd and the 3rd categories. He is a Jew by ancestry and also identifies politically as a Jew.1 Albert Einstein? The Jury is out on that one but it would be reasonable to argue that he subscribes to the 2nd category. I argue that it is the Jewish political element, the subscription to the 3rd category that leads towards some unsavoury acts whether they be the cold blood murder of Palestinian families or extensive Jewish Lobbying in the West. Those acts deserve criticism, politically and ideologically. Attorney Barclay Johnson: But how does this model help this court to further its understanding the case of Arthur Topham or the accusation of hate speech? Expert Witness Gilad Atzmon: As I mentioned before, categories 1 & 2 are totally innocent. And indeed, no one really criticises Neturei Karta (Torah Jews) or Satmar Jews in related to Israeli crimes in Palestine. These two ultra orthodox Jewish groups made it clear that they oppose the crimes committed by the Jewish State and Zionism. Moreover, nowadays, no one really criticises Jews as a race, biology or ethnicity. What we do see is opposition Jewish politics and ideology. However and this is crucial. In the West we tend to believe that every politics & ideology must be subject to political and ideological criticism. My Lord, if every form of politics and ideology must be subject to criticism, this rule must be applied also to Jewish politics and ideology, and as far as I can tell, Jewish politics and ideology deserves a lot of criticism. Attorney Barclay Johnson: But it seems as if Jews are often feel hated if their politics is criticised. Expert Witness Gilad Atzmon: Correct, yet, the fact that Jews feel hated doesn’t mean that anyone really hates them. It is also be possible that some Jews feel hated because they actually project their own hatred onto others. Attorney Barclay Johnson: I am slightly confused here it seems as if we are dealing with a sophisticated multi layered identity. Expert Witness Gilad Atzmon: You are totally correct, this topic is indeed confusing and for a reason. Contemporary Diaspora Jewish politics struggles to maintain this confusion because it stifles any from of criticism of Jewish politics. 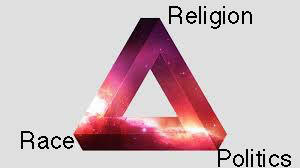 In order to understand this construct we should imagine the following kosher trinity. When we criticise Jewish politics (Israel, Zionism, the Lobby etc’) some Jews are“racially offended” in spite of the fact that race, biology, blood or ethnicity was never mentioned. When we criticise Jewish racism some Jews hide behind the argument that we are criticizing their religion. When we occasionally criticise the religion or some obscene Jewish religious teaching we are quick to learn that Jews are hardly religious anymore (which is true by the way). The meaning of it is simple, yet devastating. The Jewish triangle makes it very difficult, or even impossible to criticise Jewish politics, ideology and racism because the Identity is set as a field with a tri-polar gravity centre. The identity morphs endlessly. The contemporary 3rd category (political) Jew is everywhere and nowhere simultaneously, this is the quantum mechanics that is set to suppress any possible criticism. Attorney Barclay Johnson: In the last 7 days this court learned about some very problematic segments within the Talmud and the Torah. Yet, you insist here that the religion is innocent. Can you please enlighten us about the role of religion? Expert Witness Gilad Atzmon: This is a crucial point. While I argue that the Jewish religion is an innocent category, this is far from saying that Judaism is clean of some very problematic teachings and even racist and supremacist preaching. Here is the problem. The historical facts are plain. In spite of some very problematic Judaic teachings that are both Talmud and Torah related, rabbinical Jews have never been involved in any collective murderous attempt against anyone else. This fact suggests that in spite of some horrid segments, it was actually the Talmud that restrained the Jews for centuries. Such a view vindicates the Talmud despite its uncomfortable teachings. But things are about to get very uncomfortable now. It is not a secret that in contemporary Israel, it is the orthodox Jews and the followers of the Talmud who lead the most racist and murderous abuse of the indigenous Palestinian population. Thus, we have a clear question to answer. If it was the Talmud that restrained the Jews for centuries, why doesn’t it restrain orthodox Israeli Jews now? The orthodox rabbis argue that it is the addition of political orientation that interfered with Judaic peaceful teaching. Another possible answer is that we were wrong all along. It wasn’t the Talmud that restrained the Jews, actually it was the ‘anti-Semitic’ church that repressed Jews. The collapse of the Church together with the rise of Israel and the influential Jewish lobbies in the West have led to a severe sense of impunity that is translated into a tsunami of violence and rise of Jewish supremacy that is religiously driven. Here are some marbles taken from the Rabbi Ovadia Yossef, an Israeli Chief Sepharadi Rabbi. — Weekly Saturday night sermon in December 2009. I cannot judge whether this is indeed the case but I can clearly say that the only way to deal with these issues is to discuss them openly and to make sure that as much information as possible is available to all of us. Ladies and Gentlemen, I do believe that this is the principle that guides Arthur Topham, who for over 30 years has made some of the most important texts on the matter available to us all. I wouldn’t know about ‘Germany Must Perish’ unless Mr Topham had made it into a satire. Would you? Even the Crown Expert, Mr Rudner, admitted that he wasn’t aware of the text and actually confirmed by this admission the importance of the Radical Press. Two days ago Mr Rudner admitted that ‘Germany Must Perish’ is a hateful text. Congratulation to Mr Rudner. It took the Jewish world more than seven decades to denounce one of the most horrible Jewish texts ever. Is not Mr Rudner’s long awaited denunciation the direct outcome of Mr Topham’s satire? Expert Witness Gilad Atzmon: History becomes a meaningful adventure once we learn to narrate the past as we move along. This means that as we are changing constantly, our understanding of the past is also shifting. Accordingly, history, at its best, is the ability to visit, re-visit and revise our past as we progress in time. This understanding of history must be applied to any chapter in our past including the Holocaust. It is no secret that Jewish institutions oppose the Holocaust being subjected to revision and the outcome of this opposition is tragic, especially for the Jews. Instead of letting the Holocaust become a dynamic universal ethical lesson it has been reduced into the new canonical Jewish religion. It has its shrines (museums) prophets, preachers and even a new God figure: ‘The Jew,’ the one who was forsaken by God, yet resurrected himself from the slaughter, and against all odds, made Israel into a nuclear super power that too often threatens world peace. Once again, our duty to the Jews, to humanity, to Canada as well as to Israel is to fight this intellectual stagnation. To burst the bubble with an injection of refreshing and controversial thoughts. But isn’t that what Radical Press and Arthur Topham have been doing for the last 35 years? Ladies and Gentlemen, one of the most disturbing images of National Socialist Germany’s persecution of the Jews are those old archive films of book burning. It is rather disturbing that in Canada in 2015 it is actually the Jewish lobby that leads the call for book burning. One would expect Jews to draw the necessary lesson from the Shoah. Freedom of speech and expression are our most precious assets. It is what made Athens into the core of universal thinking. It is down to us to keep this promise for the sake of our future generations and humanism in general. This article was posted on Monday, November 9th, 2015 at 7:12am and is filed under Canada, Justice, Narrative, Zionism.